Milan once used to be a little Venice with a 150km long network of canals, connecting the city with the rivers and lakes around. Unfortunately, most of them have been covered over time and are no longer visible but one of the remaining ones, the Naviglio Grande, is all the more special today. Starting from port Darsena, the Navigli Grande starts off with one of the most popular restaurant and bar strips in Milan. During any night of the week, this part of the Navigli becomes the place to be. My favorite part though is during the day, when it’s less busy, to bike along the canal past San Cristoforo (check my San Cristoforo Church article) until, well, until wherever you want to go really. If you don’t have your own bike, take a day pass from the bike sharing service provided by the city. 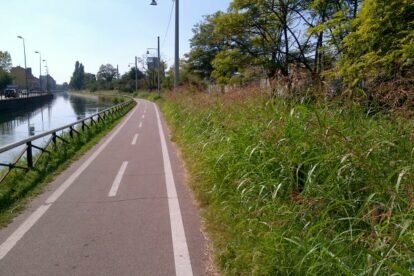 Just a few minutes out of the “known” part of the Navigli, you quickly feel very far from the big city, cycling through neighboring villages that preserved the charm of the old days. A bit further, you can see the abandoned Olympic park that is now home to graffiti and skaters. Tip: if you should want to cross the Naviglio Grande, don’t be picky with the bridges as there might be long strips where your only possibility to get to the other side is to swim.